Stick and Tissue Forum - Easy Built ( HA-HA) Baby Hornet. 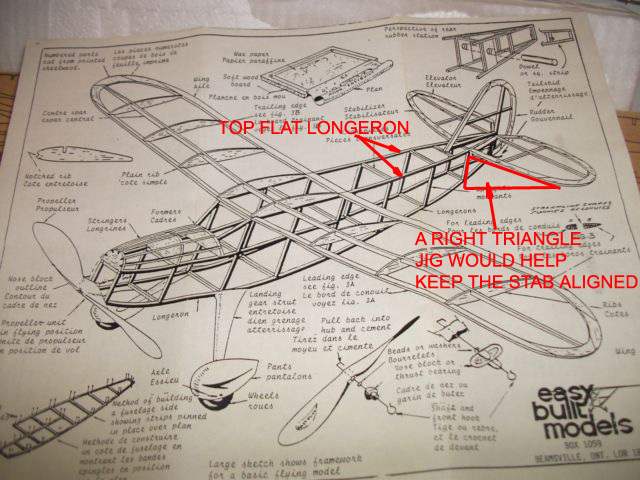 Stick and Tissue Forum › How to build model airplanes › Current Rubber Powered Builds by S&T members › Easy Built ( HA-HA) Baby Hornet. You are correct,Sky9Pilot, the plan that you show is not the plan for Baby Hornet in the picture. Kit 31 for the Baby Hornet, which is what I have and what the pictured model is, has a turtle back with stringers running the full length of the top of the fuselage. The top longeron of the fuselage frame is flat and could serve as a "platform" for the stabilizer, but the topside stringers (there are 5 stringers forming the turtleback) need some sort of terminal mounting location at the rear of the top of the fuselage. I converted the stabilizer into a one piece unit which mI think would make for a more stable assembled unit. Mounting that single piece stabilizer and still finding a way to finish off the top sturtle back stringers is my problem. Hmm! I will look to see if there are instructions as to how to add a photo to my post and send pictures when I figure out how to do that. If there is not site menu with instructions for adding pictures, maybe you could tell me what I need to do post pictures. If you could post a pic of the plan that shows the side view of the fuselage at the stabilizer and another of the stabilizer itself, it might clear some things up. If the stabilizer is in two pieces then, unless you are entering it in some kind of Old Timers model event, I would recommend building the stabilizer in one piece and mounting it directly to the fuselage. If necessary, build the fuselage sides to allow for mounting the stabilizer at the correct angle. Not having ever built the Baby Hornet I looked at some pictures online to see what we're talking about. From what I can see, it appears that the horizontal stab panels are glued to the longerons that are in line with the fuselage top box structure. I assume (which is always dangerous) that the fuselage box was built upside down on this top longeron because it's flat. Does the wing sit on this same longeron? If so this would give the horizontal stab zero incidence, unless the wing has been given some incidence at it's leading edge. As for mounting the stab panels, a small jig could be built keeping the horizontal stab panels level and at 90 degrees to the top longeron the panel would be glued to. Just my observations from looking at plans and pictures of the model... I have noticed that the plan doesn't match the picture of the model that's suppose to be the Baby Hornet. But the principles still apply. Of course the jig could be much more than the right triangle. I like to use foam board from the Dollar Store to make these jigs from. I am a fairly experienced builder, but I am sure having a problem trying to understand how the stab is supposed to be mounted to my BABY HORNET. I would think that a one piece stab ( if I could figure out how to modify the fuselage assembly to accept it) would be a much better mounting than trying to get the 2 piece stab attached and mounted.